Sinful's newest resident, Mary-Alice Arceneaux, is thrilled when Gertie introduces her to famous romance author Almira Galvez-Whitbread. But the very next day, Almira's husband disappears. With Gertie, Fortune, and Ida Belle out of town, Mary-Alice is Almira's only friend in Sinful...and it turns out Almira's storybook marriage is far less perfect than advertised. 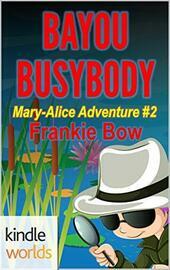 By the time Mary-Alice realizes she may be in danger, she's already in too deep. Now she has to find out what really happened to the faithless Geoffrey Whitbread--and prove she has what it takes to be a real Sinful Lady. We first met Celia's cousin-by-marriage Mary-Alice in SCHOOLED, where she played a supporting role. In MARY-ALICE MOVES IN, our heroine relocates to Sinful and takes center stage. In BAYOU BUSYBODY, Mary-Alice uses her expert knowledge (derived entirely from her mystery reading) to deal with a strange missing-person case while Ida Belle and Gertie are out of town.